I'm shocked, and it has nothing to do with the crazy antics of Honey Boo Boo or Amanda Bynes. Rather, I'm in a stupor from what my Ballot Press editor discovered while going through Paradise Not Quite Lost - I have a crutch word. For those not familiar with this, a crutch word is something used over and over in a piece you've written. You may not realize the amount of times it's used in your short story or manuscript until you turn it over to an editor. But when you see how much it's utilized, you may want to throw your laptop out the window in frustration. Just make sure your editor isn't below it when you do. My crutch word - was. I have a lead foot for all 'to be' words, but 'was' comprised the bulk of the crutch. On my editor's advisement I performed a search on the three-lettered demon. With a choked gasp, my word processing program discovered 700 instances in a 90,000 word document. A quick scan of the results prominently featured the word several times in each paragraph and, on occasion, liberally sprinkled two or three of them into one sentence. Plenty goes through your mind when you see this horror. The first is an overwhelming feeling of frustration because you need to spend countless hours narrowing the amount of these words down to a manageable number. Sadness comes next as you end up reworking lines you thought were the best thing written since Hamlet's soliloquy. Finally, when you have removed the last instance of the devil word, you feel a Scarlett O'Hara moment come on where you stand up on your office chair and declare you'll never use a crutch again. This is followed by a visit to the emergency room to set the broken leg received from slipping off the rolling office chair. In seriousness, there is a sense of catharsis once you eliminate as much of the crutch word as you can from your manuscript, and this leads to a re-evaluation of how you write your material. Thanks to the notes given by my editor, I have almost eliminated the use of 'was' in my other pieces. I've come to realize there are better ways to write a sentence, and I intend to use them when I begin to clean up the second book in the series. That way, when I send it to my publisher, I'll only need to spend days deleting all the dependent clauses as well as my newest crutch word. 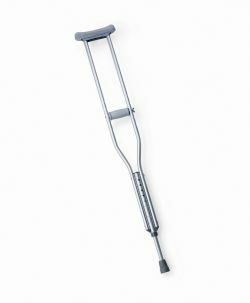 What is your favorite crutch word? I'm not sure what my favorite crutch word is at this point, but I found Ken Rand's book, "The 10% Solution" offered great instructions about getting them out of your writing. Very systematic and easy to do. It has helped me refine my writing. How on earth would I find out? I know that in conversation I use the words "delightful" and "lovely" quite a bit. Maybe I'll start with those! The editor of my first book likes to tell everyone I had a "back" problem. My characters sat back, stepped back, leaned back, looked back, etc. etc. etc. I also found heavy use of "pretty," "really," and "just." Once I eliminated those habit words, I unfortunately found new ones. Now I have to do a word search on "down" among others. I know I use "just" a lot. Thanks to you and Pat, I know have a list of crutch words to search for in my manuscripts. I once had a fellow writer who said I used "I" to many times in a personal essay and she circled every one. I was at a loss on that one, unless I switched to third person :) Delightful post - thanks! Somewhere along the way, a writing teacher put the fear of god into me about the word "was." Trying to think what my crutch words are now... I use "meanwhile" a lot in recaps. I use "a lot" a lot, as well as "a bit"... And it's a challenge to come up with new words to describe movies when I write reviews.